…Yes, we are home and this is the view from the studio this morning. Where did the last month go? I can’t believe the last 33 days went by to so fast, but when I review the images I captured while away it all comes back to me. I have shared the Christmas and Advent Market images via my blogs already. And I had the best of intentions to continue blogging while away but then the holidays arrived and with it family festivities and special events. Before we knew it, we boarded the plane to Barcelona, and our four days there were packed with exploring the city and immersing myself into an incredible time experiencing Gaudi and his architecture, not to mention the food! 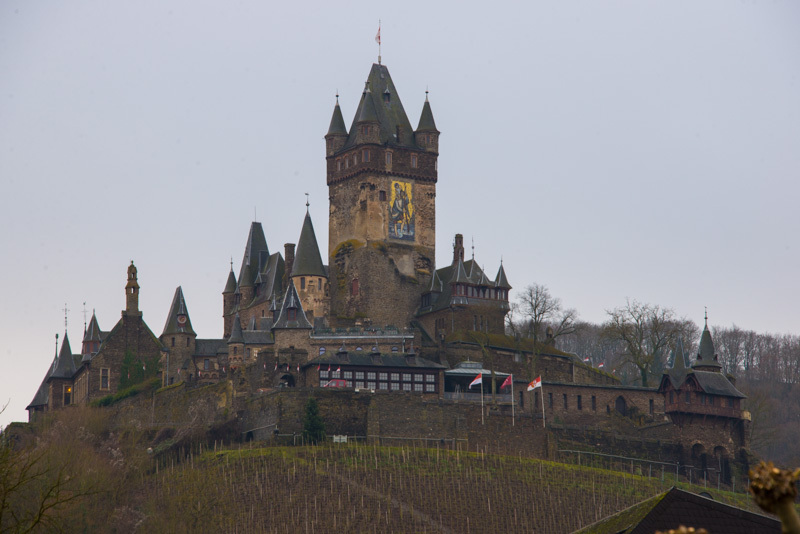 We returned to Germany for two more days with my sister and her family and only one week ago we visited Cochem, a medieval city along the Moselle river in prime wine country. It was a grey day but the historic Imperial Castle made its presence known overlooking the town. We had arrived about 30 minutes too late to participate in the daily tour (they offer only one tour a day during the winter months, during prime tourist season several tours a day are offered). We decided to walk about town and check out the ancient city gates and historic buildings. 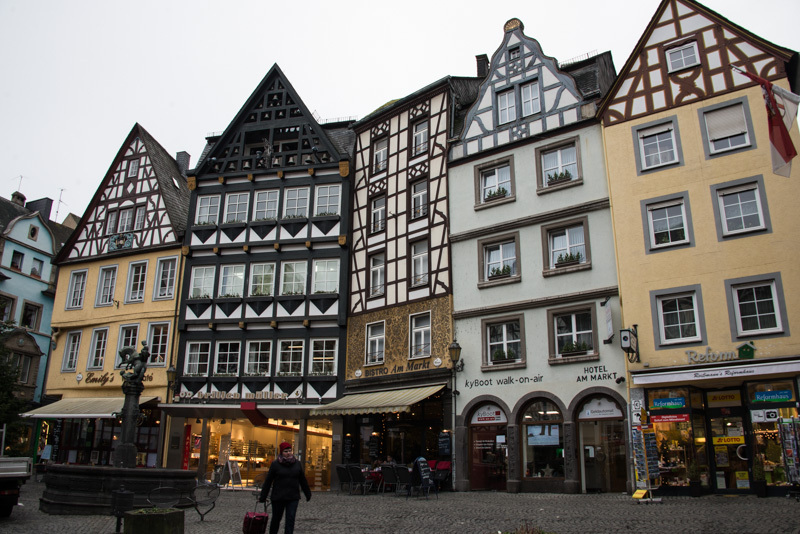 I never grow tired of the half-timber buildings which are most often at their most splendid around the market square. Cochem did not disappoint! 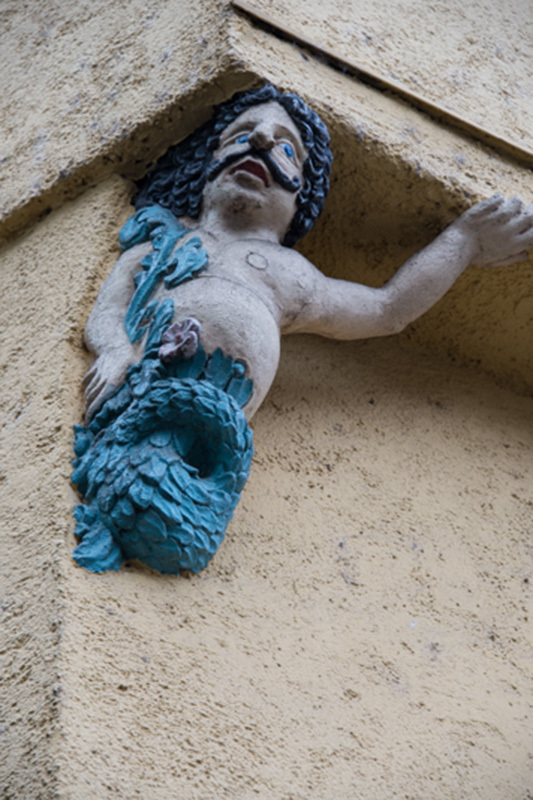 This little water nymph was holding up the corner of a building high above the market square. I love to discover such details… and am always on the look out for them. Enough holiday memories: I started my day in the studio at 6 a. m. this morning and made a long list to get organized and focused. Sorting and processing images of my time in Barcelona are part of this list. I will post my impressions on the travel blog soon. A link will be provided. Today I took the time to update several pages on my website which will be uploaded shortly. I also have several contracts to fill in and send off. My year is fully booked with teaching and judging. I am already taking bookings for 2016… but before I look that far ahead I need to carefully examine 2015. Art Quilt Campus registrations are beginning to arrive at the post office. I am processing early registrations of returning participants. I do have a few openings for the September event and will blog about this in a later post. It’s good to be back. I promise that my blog posts will resume on a more regular schedule. Blogging helps me to stay focused and communicate my goals and progress while sharing information. Happy New Year to you all! What will you be up to in 2015? If you care to share leave a comment below. 14 Jan	This entry was published on January 14, 2015 at 11:58 am. 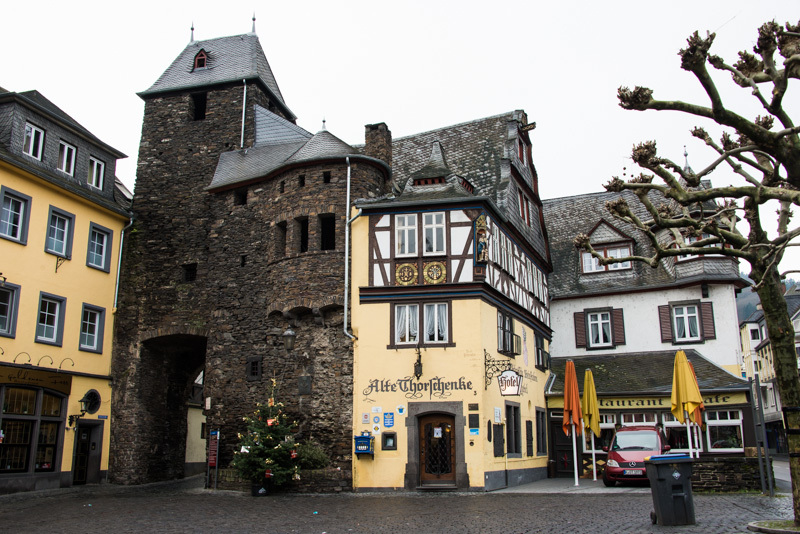 It’s filed under Creativity Update, In the News, Journaling, Landscape photography, Travel and tagged Buffalo Pound Lake, Cochem, Cochem Imperial Castle, Germany, medieval town images, return to the studio. Bookmark the permalink. Follow any comments here with the RSS feed for this post. I agree with Kathy. The accumulation of so much fabric and patterns, books, beads, wool, ribbons and such have made me do some serious thinking. This year I plan to use what I already own, and make a journal quilt each month. Something small, 8 x10 testing a new idea, or techniques I want to try. Looks like you had an awesome holiday Anna. Loved the pictures.